We allowed "All Files" in a configuration profile for our Macs on Mojave, but upon installing 6.7.500.0, we still get prompted to manually go to system preferences >> privacy and allow full disk permission. Also, another huge annoying issue that has been around for years is the ESET splash screen and the console launches upon installing the .pkg. We do not want to pop up the splash screen and ESET gui during upgrades for all of our end users. Please give us an option to do a silent install. Testing 6.7.500.0 last week we came across the same issue. It seemed like an easy fix, we had already allowed "All Files" in a configuration profile for our Macs on Mojave, so I made sure the new tcc profile was installing but again we are prompted to manually allow full disk permission. If it's using "anchor apple generic" that would make sense now. We have testing the install and upgrade on a few machines all with the same result, so it's holding up our move to production upgrades as well. And I am so in if the splash screen can be made at least scriptable option in the install process. I just spotted the same problem in our environment. Without automatically allowing full disk permission for Eset I can't deploy that new update to our users. That's a real pitty. Also +1 for the option of hiding Eset splash screen on update from .pkg. thank you for your extensive and well described feedback, we will check it internally. So it is signed, clients aren't executing unsigned code. 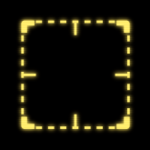 Nevertheless, we are using only the "apple anchor generic" requirement which is pretty broad. This requirement is something that the application itself specifies for the system to know when it should consider its signature valid. It seems weird to me that TCC would look at the form of the requirement, but I guess its possible. We are currently testing the possibilities how to add our product to the full disk access list in the macOS. To the GUI won't startl, then you should send them a policy to disable the splash screen and start the GUI manually. 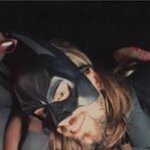 A majority of us are using Jamf’s PPPC utility to test. 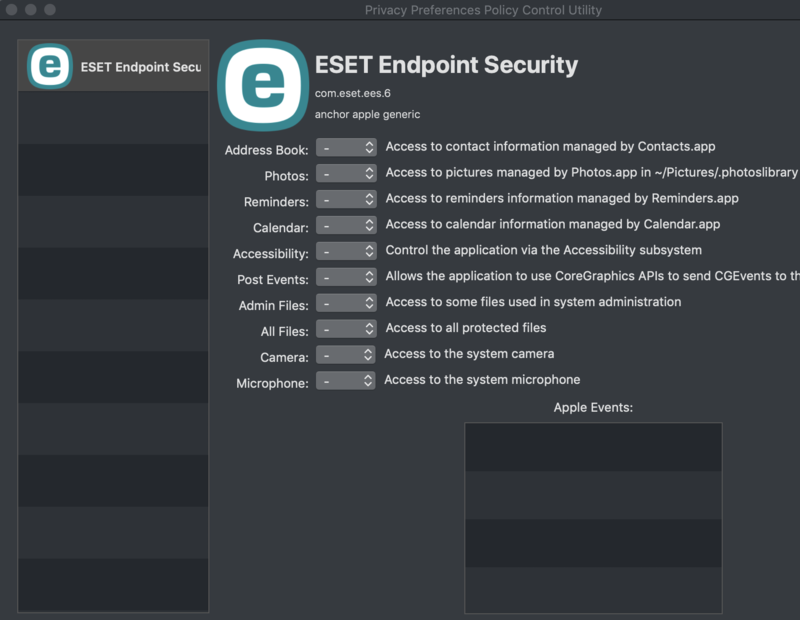 To test, create a configuration profile for eset endpoint security for full disk access, deploy via mdm, then install ESET Endpoint Security to see if the same pop up comes up. When we talk about TCC, this is a built-in mechanism by Apple in the Mojave operating system. Thanks for the suppressing gui option. Just to confirm, just create an empty file with the name above? Thank you for the additional info on the ways how you manage and test, I have forwarded it internally. Yes it should work that way. We have made some changes to the way our code signing works and now it should satisfy the requirements mentioned in this thread. Are you interested in testing a beta build with this change implemented? 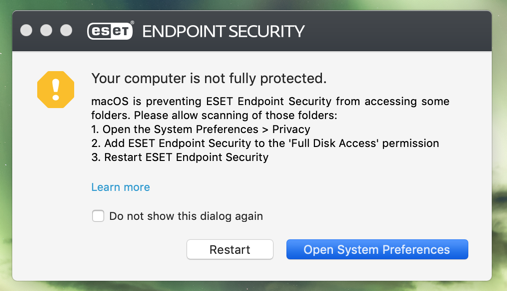 Also, to verify codesign, try "codesign -dr - /Applications/ESET\ Endpoint\ Security.app/Contents/MacOS/esets_gui"
It is returning "anchor apple generic", which is invalid. How do you even do this sort of client configuration, though? I cannot find any documentation about configuring ESET Endpoint Antivirus that actually works. esets_set is ignored by the app, as it's using a different file in a different location (/Library/Application Support/etc/esets.cfg vs /Library/Application Support/ESET/esets/cache/data/settings.json). The configuration that is actively in use (settings.json) doesn't have a command line tool to modify it (without actually learning json). @TomasP, If possible I would like to try out the beta as well. I will contact you privately with the beta build. @TomasP Could we get in on the Beta build as well? I just tested suppressing the GUI upon install by creating an empty file into the "cache" folder and it apperas to work. The esets_gui process does not launch, there is no splash screen, and no icon in the menu bar. I am able to verify that the proxy, mac, fcor, daemon, pidmapper and ctl processes are running in activity monitor. Does this mean the machine is still being fully protected? Not a huge issue, but Is there a way to suppress the splash screen upon install, but retain the ESET icon in the menu bar? Another thing I noticed is that the "do_not_launch_esets_gui_after_installation" file is removed after the install. So after every upgrade, we'll have to re-create the file. Same issue with the beta version. I've created a new config profile based on the beta to allow both all app data and system files. I tested by uninstalling ESET, applying the configuration profile, restarting the Mac, then re-installing the Beta version. I'm still running into the same issue as well. Tested by reformatting the drive, re-installing 10.14, applied profile, installed the beta. Thank you for the feedback, I sent it to our development team. We will keep you posted. I am having the same issue as well. Tried on a fresh system, my current test system, and a VM, I also created a fresh TCC profile as well. As for the silent installation - it is designed as a one-time feature. It allows to install the product without running the GUI. Then you can apply configuration that satisfies your criteria: disabling splash screen, tray icon, etc... After product upgrade, these settings would be preserved and applied to new version too. Open iPhoto and add any picture in the library (if you did not use iPhoto yet. This is required to create photo library on disk that is protected by TCC). If the file was created, Terminal has granted access and the TCC profile is working. I just finished running through the instructions for the TCC policy and tested on two machines. Attempted to create a file via terminal, no prompt to grant terminal access, file created. With some testing, does not seem to be a TCC Profile Issue. If you do a " sudo log stream -debug -predicate 'subsystem == "com.apple.TCC"' | grep 'eset'" when restarting the client on a machine with a SystemPolicyAllFiles Profile for com.eset.eea.6, you see "2018-11-30 12:30:26.438122-0500 0x477bb Info 0x534e2 314 0 tccd: [com.apple.TCC:access] Override: found override in <TCCDMDMPolicyOverride: 0x7f8cbc4009a0> for kTCCServiceSystemPolicyAllFiles and com.eset.eea.6". I'm assuming that whatever methodology ESET is using to check for access is not taking into account MDMOverrides.plist. Funnily enough, version 6.866 worked fine with the a PPPC Payload deployed. Currently engaged with support over this. Agreed, I do not think this is a TCC profile issue. 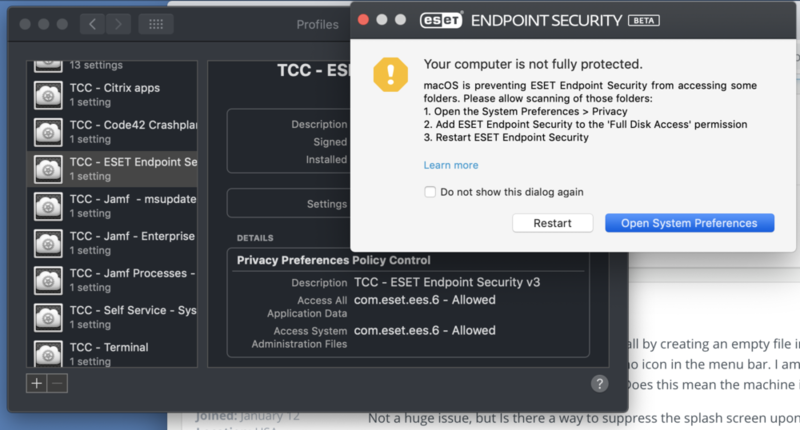 I have 8 other TCC profiles in production for various apps and have not had an issue until ESET. Is there any chance of testing the beta for the full disk access issue?